At Urban Tails, your pet is always treated to the highest quality pet care that Houston has to offer. Your pet is sure to enjoy a wide range of fun activities while staying with us. Active pets are healthy pets, and the following lodging features and accommodations were specifically created to promote the health and happiness of pets staying with us. Staff on-site 24 hours a day, 365 days a year. Multiple lodging options so you can decide what's right for your pet. Custom-design your dog's stay with our extra activities and treats to fit their personality and activity level. We maintain your pet's "home" diet. Healthy Pet Guarantee option: for a small fee per pet, we will take care of any needed veterinary care resulting from lodging-related issues (see contract for coverage specifics and exclusions). Conveniently located in downtown Houston. Our Luxury Pooch Lofts are designed for the discriminating dog that prefers quiet privacy combined with a very personalized stay. Our luxury loft lodging area is limited to 18 enclosures. You may choose a large 8'x8' or grand 9'x10' loft for your dog(s). Luxury lofts include a raised cot, personal television, check-in gift, interactive toys, and a bedtime cookie. 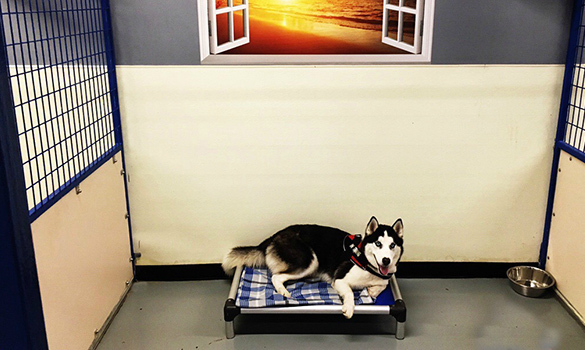 Our Standard Lofts are a spacious 8'x8' or 6'x6' and are perfect for active dogs that will be playing and swimming during the day and just need a place to rest privately at night. Guests staying in our standard lofts will receive a comfortable mat to sleep on. Padded lofts available for senior dogs or those with mobility issues. Minimal furnishings provided. We encourage you to rent bedding from Urban Tails or bring your own comfy blanket and toys from home. Multiple pets from the same family may share a loft with special discounted rates. It's a doggie slumber party! You can enjoy trips out of town with the peace of mind that your dog is having pleasant dreams sleeping over at Urban Tails. Cage-free sleepovers are reserved for our social Daycare dogs to snuggle in with their buddies. A murphy bed is available for first come first serve dogs, and we have plenty of beds on the floor for everyone else. 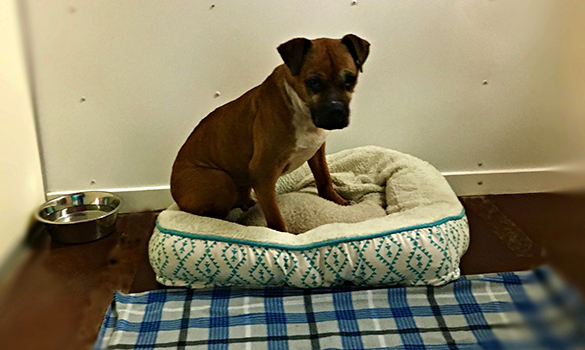 Sometimes, space is so limited on the bed that our nighttime pet attendants end up on a puppy bed on the floor while the puppies have the big bed! Dogs requiring more privacy are encouraged to bunk down in our luxury pooch lofts. To ensure a comfortable and relaxed visit, it is important that dogs wanting to sleepover come to Daycare at least one time per month to play with their friends. Need a place for your pooch to hang out just for the day? Due to popular demand, Urban Tails offers Day Lodging in our luxury lofts during our regular business hours. Your dog will get a comfortable luxury suite with a cot and television, morning and afternoon playtimes in our indoor gym, an afternoon interactive toy to keep your pup's mind busy, three potty breaks and lots of fun! Grooming is available upon request. If you live in the Houston area and you're ready to get started, call us at (713) 658-0900 or complete and fax to us the pooch personality form prior to the day you need to drop your pet off. On occasion, we may request that your pet make a short visit to our facility prior to their first lodging stay. Each dog has a unique personality and based on information provided in the dog profile, we may require this to ensure our facility can safely lodge your dog and that they will be 100% comfortable during their stay. After your first visit, all we need at check-in is for you to review the activities and feeding instructions, provide any vaccination updates, and your Healthy Pet Guarantee choice.